1. The sheer act of taking the image of the coin makes the image private property. 2. The photograph required technical skill and, therefore, is both creative and original and worthy of protection. This issue came into play in 2005 when a coin dealer in the USA claimed copyright over coin images and refused to grant permission for their use in an upcoming numismatic publication. In order to clarify its legal position that publisher consulted top copyright lawyers in the USA on the matter. The legal consensus among the copyright lawyers was that no copyright existed for coin images just as no copyright exists for photographs of paintings in the public domain. It is mostly likely that the copyright lawyers were aware of a pivotal legal case in the United States from 1999, THE BRIDGEMAN ART LIBRARY, LTD., v COREL CORPORATION 1. In order to understand why copyright for coin images does not exist, it is necessary to break apart the different components that go into making such a photograph and review the legal case itself. The coin itself must be in the public domain and not subject to copyright. If I minted a unique design for a coin last year then the coin would not be in the public domain. The design of the coin would be subject to copyright and it could not be published without my permission2 . The issue here is not the copyright of the coin photograph, but the copyright of the coin itself which presents the obstacle. If a photograph is taken of a 2,000 year old coin, the coin itself is not subject to copyright protection and, therefore, the coin is in the public domain. The same principal would apply to a painting. Most people would agree with this part. The next element is the physical reproduction of an image of the coin. Again, we are dealing only with a coin in the public domain. Most legal experts have long agreed that a photocopy or a scan would not be subject to copyright as it is not considered original or creative. Therefore, the first pillar that private property or copyright exists by the sheer act of creating an image is not true.The second pillar that is cited as a foundation for copyright of a coin photograph is that it can require some technical skill, such as proper lighting, resolution, and exposure, and consequently must be original and creative and worthy of copyright protection. However, when closely examined, this argument falls apart. The purpose of taking the photograph is to give a faithful rendering of the actual coin, not to create a work of art. The photographer is trying to give the potential buyer or reader a true sense of what the coin would look like if they had the coin in their own hands. Such a reproduction is not considered original or creative for copyright purposes in the USA. If a photographer created a montage of coin photographs or altered the image from what can be seen on the actual coin itself then a case could be argued that an original work was created. Let us review the legal case and how these issues were addressed in 1998-1999. The circumstances were as follows. Corel Corporation developed an educational CD using photographs of art works that the Bridgeman Art Library of the United Kingdom had created. The Bridgeman Library sued for copyright infringement and requested that UK law be applied in a US court. In a summary judgment in November 1998 3, the US court dismissed the suit indicating the photographs were not of original character to deserve copyright protection. Bridgeman refiled the case will additional arguments to the annoyance of Judge Kaplan. The judge however felt the issue was important and reviewed the case again. Bridgeman again requested that UK law be used. They argued the original summary judgment was as a result of a flawed conclusion of UK law as the Graves Case of 1869 was not considered. A Professor Paltry filed an amicus brief stating only US Law could be used to consider the case 4. Bridgeman countered UK law was applicable as the United States had agreed to an international treaty known as the Berne Convention in 1989 which obligated the USA to respect other national copyright laws including UK copyright laws. Bridgeman wanted UK law applied as it appeared that Britain did not require originality or creativity as the source of copyright unlike the USA. Judge Kaplan cited that the Berne Convention did not require UK law be applied but only that foreign nationals be granted copyright protection afforded to the national population of jurisdiction trying the case. Judge Kaplan decided the case the second time based on US law. Judge Kaplan again ruled against Bridgeman and cited various US law cases and the Copyright Law of 1909 as reasons to rule against copyright protection in this case. The following are extracts from the final summary judgment and outline the facts why the judge determined copyright did not exist. “ There is little doubt that many photographs, probably the overwhelming majority, reflect at least the modest amount of originality required for copyright protection. “Elements of originality . . . may include posing the subjects, lighting, angle, selection of film and camera, evoking the desired expression, and almost any other variant involved.” n39 [*197] But "slavish copying," although doubtless requiring technical skill and effort, does not qualify. n40 As the Supreme Court indicated in Feist, "sweat of the brow" alone is not the "creative spark" which is the sine qua non of originality. n41 It therefore is not entirely surprising that an attorney for the Museum of Modern Art, an entity with interests comparable to plaintiff's and its clients, not long ago presented a paper acknowledging that a photograph of a two- dimensional public domain work of art "might not have enough originality to be eligible for its own copyright." n42. The allegedly greater skill required to make an exact photographic, as opposed to Xerographic or comparable, copy is immaterial. As the Privy Council wrote in Interlego AG v. Tyco Industries, Inc., n48 "skill, labor or judgment merely in the process of copying cannot confer originality . . . ." n49 The point is [*199] exactly the same as the unprotectibility under U.S. law of a "slavish copy." Many museums reviewed their policies especially those in Britain after the US ruling. A group called "Museums Copyright Group " of the United Kingdom commissioned a report on behalf of British museums to look into the consequenes of the US court decision. They determined the UK copyright law was still intact but it interesting to note the later part of the following comment from the report, "Bridgeman -v- Corel is not binding in the UK and is of doubtful authority even in the USA" 5. One must contrast this comment with the comment from the following source" “Speaking about this case, an attorney for the American Association of Museums said: "Just about every museum attorney looking at the case objectively thinks it came out the correct way according to U.S. copyright law -- that's why no museum had ever brought such a suit.... It would have been unwise for AAM to be on Bridgeman's side in this case because it would have undermined our credibility” 6 . This clearly shows that not only before the decision but even after the decision the British Museums did not grasp the fundemantal difference between British copyright law and US copyright law, namely the requirment of originality and creativity. This ruling in 1999 in the Southern District of New York is not established law outside the district. However, the precedent of the case and the logic applied undoubtedly is sound enough that no one has dared challenge it any further in the USA. Museums have restricted access to images and works of art but will often supply them when they receive a signed contract thereby protecting their reproduction rights. Therefore the museums are seeking protection under contract law not and not copyright law. Some people attempted to believe the US ruling applied only to two dimensional art, which is a misreading of the case. The reference to two demensional art (as seen above) related to the judge quoting a paper published by a museum attorney in which the attorney doubted copyright existed in this area. The basic tenet is that if a photographer is attempting to create an exact photographic copy of a work of art or coin that is in the public domain then it is not covered by copyright in the USA. 1. The Bridgeman Art Library, Ltd. v. Corel36 F. Supp. 2d 191; 1999 U.S. Dist. LEXIS 1731; 50 U.S.P.Q.2D (BNA) 1110. 2. This could be published under the Fair Use if related to a critique or a review. Note : The author of the above article is not a lawyer and this article should not be construed as legal advice. 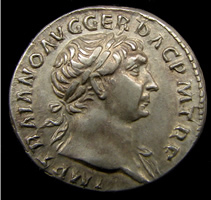 The photograph of a coin of the Emperor Trajan above was taken by the author. No copyright is attached to this coin image as it is a true representation of the coin itself and devoid of creative input from the author per US copyright law.